Talk to anyone, anytime, about anything — with confidence. 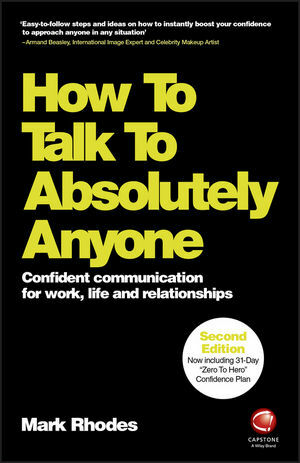 How to Talk to Absolutely Anyone is your personal handbook for stepping up your communication game. Part confidence coach and part social manual, this book reveals the reasons behind your reserve and offers real, practical ways to break through the barriers and make a connection. Whether you fear judgement and rejection or just don't know what to say, these simple exercises will equip you with a gold mine of social tools to get you through any situation. This new second edition has been updated to include the complete 30-day Zero to Hero Personal Confidence Course, to help you build your skills and increase your chances of getting what you want out of any conversation. Working step-by-step, you'll learn how to approach strangers, strike up a conversation and exit gracefully; by first changing your outlook, you develop the ability to navigate even tricky situations with confidence and ease. Strike up a conversation with anyone, anywhere. Open up to make real connections and build strong rapport. Carry your confidence into networking, sales and more. Leave the days of awkwardness behind you. Stop running away from uncomfortable interactions and start getting comfortable instead. Whether you need to close the deal, build contacts or just make small talk at a party, How to Talk to Absolutely Anyone helps you build the confidence and skills you need to talk your way to success. Mark Rhodes is an Entrepreneur, Business Mentor, Published Author, International Speaker and Trainer in Success, showing individuals and businesses around the world how to massively improve their results with little or no extra effort. He helps people, whether in business or not, to be the best that they can be. He does this by helping people have more confidence and direction and by helping businesses win more sales, get more clients and customers and achieve their business goals. This is done using the very same approaches, ideas and techniques that Mark has used for his own success. It’s not about "in your face" selling either, far from it, in fact Mark's work also includes working with professional firms such as banks, accountants, solicitors and legal firms, for whom Mark's approach is an ideal fit, in addition to more traditional businesses that he also helps covering most industries and sectors you could name. Marks clients include HSBC, Natwest, Lloyds Bank, BooHoo.com, and the Institute of Chartered Accountants, to name a few. 1 Fear – Does It Hold You Back? 6 How – How Do You Mentally and Physically Approach? 7 What – What Do You Say?